Storage managers seem to move at a glacial pace when updating their backup tools and processes. Techniques that became obsolete years ago are still well entrenched in data centers across the country. 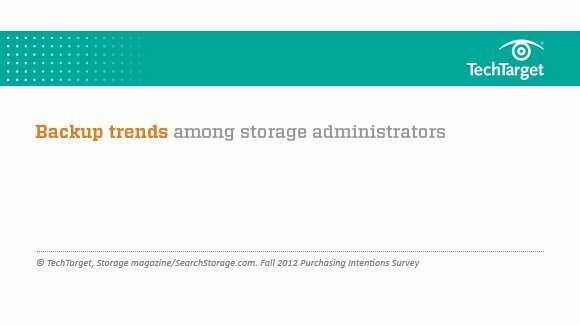 Our fourth of five reports on Storage magazine's fall 2012 storage Purchasing Intentions survey results can help inform your decisions around which business backup tools and technologies you should be offering to customers. In the survey, we discovered backup trends by examining respondents' plans around data backup solutions using tape, disk and the cloud, with an eye on how virtual servers and endpoint devices are being backed up. This survey was directed and analyzed by Rich Castagna, editorial director of Storage magazine and TechTarget's Storage Media Group of websites. It was conducted in September 2012, and respondents were screened for specific storage purchasing authority. There were 702 qualified respondents from among all vertical industries, reporting an average annual revenue of $1.3 billion and an average 1.7 petabytes of data under management on all types of media.